Attending the Spring Races is a commitment to style, elegance and adventurous sophistication. Whether you're attending the local races, Royal Randwick or Flemington, the annual Spring Carnival is an opportunity to be seen and showcase the latest fashion and accessories. With effortless 'mussed' hair the beauty forecast for Australian Spring/Summer 2010, decorative headwear will be embraced to take the look to a whole new level as we showcase fabulous hair and fabulous fascinators. Trends will lean away from the wintery tones of the colder months and make a welcome change to brighter pinks, lemons, aquas and feminine florals. Set the style on and off the field in with the latest looks from Lady Jayne. 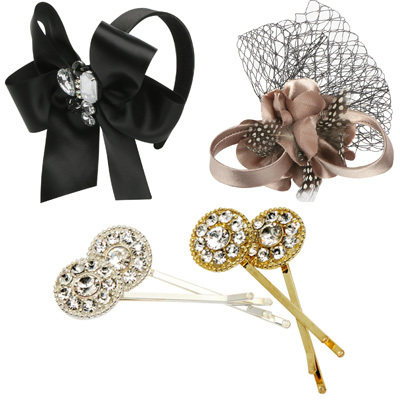 Lady Jayne's instyle range brings you the quintessential hair accessories for your statement racing outfit this season. Offering fascinators, headbands and to-die-for decorated clips, Lady Jayne has an accessory to compliment every outfit to ensure you are the best looking filly on the field. When your outfit is your statement, select subtle and complimentary colours to avoid that accidentally-achieved garish look. When accessorising your killer LBD (little black dress), opt for a statement fascinator in a bright colour and choose bold accessories, like shoes and clutches, in fearlessly dazzling colours. Accesorise your favourite LBD (little black dress) with this chic black and purple fascinator from Lady Jayne. The stylish purple feathers and net tear drops are an elegant addition and would look great with a matching pair of purple stilettos. Add a splash of colour with an embellished instyle headband. The bright pink flower, black feathers and white mesh will compliment a cream race day ensemble and will showcase a simple hair style such as a topknot or low side bun. This headband is a classic combination of elegance and style and will work with numerous outfits with its beautiful cream, black and pink flowers. The bandeau suits a shorter, chic cut like a blunt bob or blunt fringe, but also works well with long tousled locks. For a more contemporary look, add a hint of jewelled splendour with this bow-inspired decorated Bandeau. Available in black. Understated and chic, this fascinator features warm golden tan and black hues. Worn slightly tilted to the side with hair pulled into a low ponytail or quiff - adorn with matching gloves and shoes for race day appeal. you can't get enough of this kind of racing glamour. Want effortless style this spring carnival? Embrace Lady Jayne's decorative headwear for fabulous fascinators with out the expense.